About a year and a half ago I warned bloggers and content creators to take author markup and authority and Google+ seriously. Google was making under the hood noise about attaching authority to content published by individuals based on a variety of factors. I advised bloggers to follow Google’s instruction to link their blog posts and about us pages to their Google+ profile in order that Google might start enhancing search results with goodies like profile pictures as below. Here’s a tutorial on how to get author markup added using one of my favorite plugins. By asking authors to add the attribute rel=”author” to their content Google was creating a way to beat spammers and duplicate content to a degree by attaching the real author to the original content. Now I ask you – when doing a search, which result are you drawn to – the first one or the one with a friendly looking, smiley guy next to it? This fact alone makes taking the time to add the required elements a no-brainer. More recently Google has admitted that they are testing author authority in a much bigger way and actually choosing content to index based on this ranking. Author authority is, like most things Google, a bit of a mystery, but you can bet that content that is found, shared and +1’d in Google+ is helping an author’s authority. 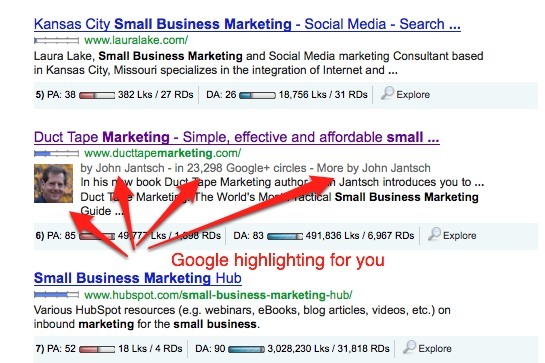 This dollop of search fairy dust is why you cannot ignore Google+ or rel=author attributes. If that weren’t enough Google is also allowing you to tell them where you contribute content. Think about that one for a bit. Now that brilliant post you submitted to Mashable, Huff Post or Social Media Examiner is going add to your author authority in some meaningful way perhaps. By creating an authority ranking of sorts Google is creating another way to beat link spam and assign authority and importance to all manner of things left about the web such as comments, Quora answers, and Retweets. So now we have an entirely new networking landscape. Instead of simply networking for links, we’ll have to get good at identifying and networking for author authority. But perhaps I’m getting ahead of myself – first things first, it’s time to go to work on your own author authority. Hmm, I wonder if a Wikipedia page would help? You can also start the process of signing up for Google Authorship here. Plenty of authors and SEO types are covering this top these days and you would do yourself a favor to start your research with these two pieces from Copyblogger. Brian Clark on why you need to get on Google+ and 64 Google+ Content Strategies.